I really hate it when I feel pain in my posterior and I look around, only to find it’s my words that are biting me in the rear. Happens more often than I would like. Some of you may remember after my last race that my man offered to take on my run training. You can read the full race recap here , but the short version is that I did not meet my very conservative time goal. And, I missed it by two minutes. TWO MINUTES!!!! My man, who had driven down to the race to surprise me, got to listen to me moan and groan while he drove me to Starbucks for my celebration drink. He listened in silence until I had my mouth full of hot coffee and was finally quiet, then he offered his wisdom. “You know why you didn’t make your goal, don’t you? You don’t push yourself hard enough.” Really not what I wanted to hear; but truth, nevertheless. In subsequent conversations, we came up with some new goals and he offered to coach me to them. Now, I learned a long time ago that running together is really not the best thing for our marriage. But, I also learned a long time ago that his competitive edge is much sharper than mine. I’m more inclined to stop and smell the roses than to run for the roses, so we agreed. We are now three months in, and so far, we’ve worked together fairly well. He’s a little hard of hearing, so he can’t usually hear some of the things I call him as we run, and I’m slowly learning to push myself a little harder than I really want to. Take yesterday’s long run, for example. We were only going for seven, so we got started about 6 am. We set off at what I felt was too fast a pace, but Gary pushed us forward, keeping us a little faster than the 12 minute mile pace which is the first goal we’ve set for me. I wanted to go a little slower to start so that I would still have steam at the end to really push the last half mile, but I matched his pace, and on we ran. The last mile, we picked up the pace some, then at a half mile from the end, we pushed a little more. At the quarter mile mark, we (or I – for Gary this is a very easy pace) pushed as hard as we could to finish the last mile at an 11 minute pace. As we headed to that last push, I complained to Gary that if he hadn’t pushed me so hard on the first mile, I would have more steam for the finish. And that’s when my words came back to haunt me. He said, “It’s all in your mind.” Geez. I hate when that happens. Don’t tell him I said this, but he’s right. The truth is, I can easily push a 12 minute pace at this point, especially on a seven miler. I could probably do it faster than that, but my mind keeps holding me back. The bottom line is, if I want to get faster, I need to run faster. It’s as simple as that. The trouble with that is that it hurts to run faster. One of the cool things about running is the way the lessons learned in training/racing mimic life’s lessons. You get out of life exactly what you put into it. Coast along and your life will never improve; keep doing what you always did, and you’ll get what you always got. If you want your business to succeed, you work hard, long hours; you don’t quit when it gets tough; you push through the rough spots. The same with marriage and relationships. You don’t quit when it gets hard, you buckle down and ride it out. We had a couple speak at church last night who shared the trials of their marriage and how they weathered the storm. 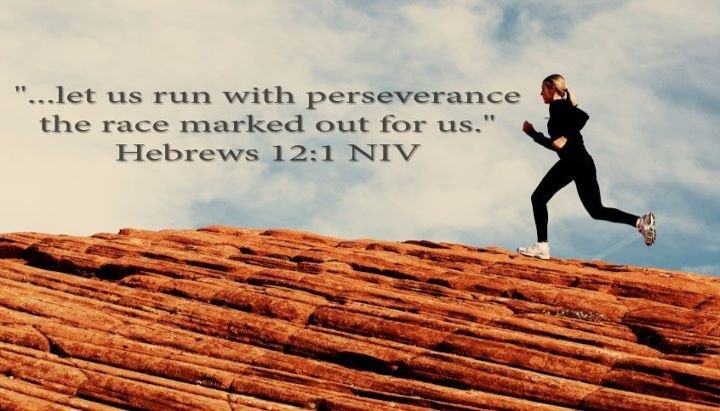 One of the passages of scripture she shared was so applicable to all areas of life, including running, that I wanted to offer it here. Spot on, right? Discipline is painful. Stretching yourself to meet new goals is painful. Fun, exciting, rewarding – but painful. Redemptive pain. Pain that has a reward at the end. My goal for this year has been very simple. Lose the weight and prepare myself for next year, when I’m going to attempt to run farther and faster than I ever have. Yes, I’ll be another year older. So what? I believe that I can keep on improving throughout my life. Every race won’t be a PR, but every run, every step, will bring me closer to being the me that I desire to be. The best that God has planned for me. He wants that for me, why shouldn’t I? For years, I’ve watched elite runners as they perform feats of running the likes of which we mere mortals only dream. The Geoffrey Mutais, Ryan Halls, Meb Keflezighis. The Deena Kastors, Paula Radcliffes, Grete Waitzs. The names and faces change over the years, but one thing remains constant. They’re fast. Wicked fast. And, the question is always in my mind, “How the heck do they do that?” How do you train your body to run a 2:03 marathon (Geoffrey Mutai – Boston, 2011, a 4:42 pace), or a 2:15 (Paula Radcliffe – London, 2003, a 5:09 pace). That’s a five minute mile (more or less). How do you make your body do that for 26.2 miles? The answer is that you don’t just train your body, you train your mind. Now, please don’t misunderstand me. There’s no possible way I could EVER train my body or mind to run at a pace like that for one mile, let alone 26.2. But, I’ve learned over the years that it’s not just about getting your body to move over that distance, you have to train your mind. Here’s the thing about running. A good run makes you feel strong, even bulletproof. It makes you look forward to the next one, to know that you can kick its tail. But, a bad run gets in your mind, sets up camp in your psyche. It whispers mean things to you, makes you believe you’ve lost it, you’ll never have another good run. Take last week’s long run, for example. I was scheduled to run nine. The run started well enough, I ran the first four at my goal pace, but at mile 5, nausea set in. I slowed to a walk, but to no avail, mile 6 involved a short visit to the woods to throw up my breakfast (note to self – no turkey bacon before running), then that slow walk of shame to the end of the “run”, which turned into 7.5 instead of 9. Ok, I told myself. That one was a bust, but it’s done – move forward. Tuesday’s training run was a shuffle, another try on Wednesday morning brought the same results. By now, the whispers had started. “You’re not a real runner. 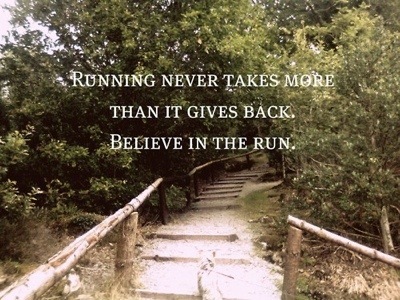 A real runner would never walk. Or let a little vomit slow her down. A real runner runs through pain and nausea, steps over the mess on the ground and keeps on trucking.” All lies, of course. Although, I do know people who believe those things. I call them “temporary runners”. They’re running straight to long term injury or burnout, and will most likely not be running twenty years from now. But, still. The lies work a number on your mind. This morning’s run was my first scheduled double digit run since the early March half marathon in Seaside. I haven’t pushed this year, my goals are different for 2012, so I’m not doing a lot of racing. I have a half marathon scheduled for the end of November, but no other races that I’m pushing toward. Lots of reasons there, I’ll share them in another post. The result of that has been wonderful. I’m building my mileage very, very slowly, concentrating on form and learning to maintain a desired pace. But, after the mind games of the previous week, my confidence was shaky. Doubt set in yesterday, and I even said the words aloud to my husband, “I don’t know if I have a 10 miler in me.” In his usual, quiet, serene way, he replied, “Yes, you do.” No discussion, no argument, just words full of confidence. Words I needed. So, this morning, we got up early. I fed my man his omelette, bacon, and toast, and sent him on his way (he has a motorcycle race today – at Angola prison, no less). In my anxiety last night, I had laid out everything I needed, so I geared up and headed to our local rails to trails (Longleaf Trace) that is the sight of most of my long runs. Motivation, in her usual fickle way, chose to sleep in, and the voices in my head threatened to overwhelm my shaky desire to run. But, I cranked up my praise and worship music and drowned them out. I got out to the Trace with all my usual gear, Ipod clipped to my shirt, but earbuds tucked in. I chose to start my run with no music or chatter, just a long talk with God, and as usual, He was more than up to the challenge. I decided to set a 3:1 run/walk interval, so I set my timer and off I went. The stillness of the early morning, the only sounds being the birds, crickets, the steady plop of my feet, the low, steady beep of my timer, and the occasional cyclist whizzing by worked its magic, and before I knew it, five miles were done. Still felt strong at mile 9, so I turned off my timer for the last mile and just ran. Excellent, soul soothing run. One that I almost let the mind games take away from me. 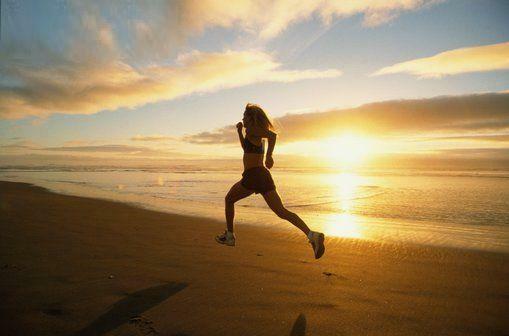 Running is an exercise for the mind, body, and soul. It’s vital that all those elements are engaged if you’re going to be successful for the long term. Visualization of who you are and who you want to be play an important role. Be realistic, but dream big. I’ll never be an elite runner, will never even be highly competitive in my age group. But, I’ll be the best that I can be, I’ll constantly toe the line to see how far and how fast I can go. One of my favorite quotes is: “The only thing that keeps us from running farther (or faster) is the belief that we can’t.” Don’t listen when your mind tells you that you can’t do this. You can. Make your mind a believer. It’s graduation time all over the country, and I have several friends and family members who are graduating from high school or college. I’m so proud of their achievements, excited for their futures, and looking forward to all that God has planned for them. As I’ve read posts on social media sites, I’ve noticed a running theme in a lot of them. Many of the well wishers have encouraged the graduates to enjoy these times, as they are the best times of their lives. Some of these were posted by young people, but many were posted by older folks, and it troubled me. Is our youth really the best time of our life? I beg to differ. I certainly enjoyed my youth. Raised in a loving, Christian home, I attended a high quality school and received an excellent education. I had many friends, participated in lots of things. We didn’t have a lot of money, but we certainly never really wanted for anything. Probably had you asked me then, I would have told you that, yes, that was the best time of my life. I married young and my early twenties were filled with a new marriage, a new step daughter, financial woes, college years. They were also filled with laughter , love, fighting, fun, the ups and downs that all young couples face. I think that I would have easily qualified that as the best time of my life. I became a mother at 27, and the memories of those early years are some of the sweetest memories I have. Naps taken with an infant, first words, first steps, Sunday mornings in church, sweet baby smells. Yes, that was the best time of my life. As my daughters grew, the challenges changed. They became teenagers, with all the fun that that entails. Mood swings, more laughter, fighting, crying, and fun. Teenagers will either age you quickly, or make you into solid steel. I chose the latter. Definitely the best time of my life. My kids have grown into beautiful, hard working, intelligent women who don’t really need my hand at their backs all the time. That young boy I married so many years ago has become the most spectacular man. He and I have time to travel and play, we work together, live, laugh and love together. This is absolutely the best time of my life. Lest you think I’ve had no truly dark times, let me assure you that there were. There were seasons of my life that I battled depression. A very long, dark season when a family situation threatened to engulf me. The years my sisters and I spent taking care of our elderly parents, only to have to eventually put them in a nursing home. Easily the worst day of my life, bar none. Also, the best times of my life. I grew more spiritually during the dark times than I ever grew in the light. My strength was discovered (not mine at all, but the One who provides it) and I was refined. A process that is still ongoing. Those were the best times of my life. So, graduates, don’t think you have to grieve the passing of these days. You have many, many seasons of life ahead, and, if you allow them to be, they will be the best times of your life, even when they’re not. One of the most mystifying aspects of running to me is nutrition. I love to eat. What a minute, I don’t think you heard that: I LOVE TO EAT! I am a southern girl and I was weaned from mother’s milk straight to fried chicken, fried okra, cornbread, and chocolate cake. I have lots of happy foods, but some of my favorites are spaghetti with meat sauce (spaghetti of the enriched, white variety); pizza loaded with meat, cheese and extra thick crust; cakes of almost any variety, but especially birthday or wedding cake, red velvet, Italian cream, really moist chocolate. You get the idea. Happy food is whatever your go to food is when you’ve had a bad day, and most of mine is heavily drenched in fat, sugar, and enriched white flour. For most of my adult life, though, I’ve been a fairly wise eater, indulging in the worst offending foods on rare occasions. I’ve never really been a health nut about nutrition, but I’ve tried to reign in my worst eating habits and have been fairly successful over the years. I’m not a fad dieter, never tried such diets as “The Grapefruit Diet”, or “The Cabbage Diet”, although those were (maybe still are) making the circles of my friends with varying degrees of success. I have done a variety of diets, including Weight Watchers and Nutrisystem, with great success, but inevitably slip back into poor eating patterns, especially during times of stress or really busy work seasons. Nutrition, it turns out, is a very personal issue. What works for one may not work for another, so I think that finding out the best eating plan for yourself is really a matter of trial and error. Over the last few years, I’ve been on a journey to become the best person I can be, spiritually, emotionally, and physically. I’ve shared a lot of that journey here. I recently listened to an Andy Stanley podcast that was a replay of a sermon he presented at the first of the year entitled “Just One Thing”, and it reminded me that I needed to provide an update to this year’s focus for me – my weight loss goal. I decided at the beginning of the year that I was going to whittle my goals down to just one thing. The one thing that I felt would help the other goals become more manageable – losing the weight that has steadily crept up on me over the last six years. Weight management is one of those things that almost all human beings have in common. We obsess over it, micro manage it, and jump on every new bandwagon that promises “fast, easy weight loss with no dieting and no exercise”. We’re constantly looking for that magic pill or elixir that will have us bikini ready by summer, even when it is a detriment to our health. I’ve never been much of a bandwagon gal, but I’ve known my share of desperation and desire for a quick fix. I’ve learned that most diet plans work, but for me, a diet plan has never been a long term solution. Enter my 50’s. A decade that was preceded by weight gain, then a return to fitness as I began to regularly train, then run, then a year that was devoted to training for a marathon in which I gained an additional ten pounds. The marathon weight gain is not unusual, and is a discussion for another day, but the pounds are there just the same and they are stubbornly refusing to leave their newfound home. I know from past experience that any “diet” for me will have to be a life-style. The challenge has been in finding the right, nutritionally balanced eating plan that satisfies my appetite and is life proof. A plan that doesn’t require complicated recipes, hours devoted to meal planning and preparation, and that still offers food that tastes good and that I’m willing to eat for life. Gary has jumped on this with me, which makes it much, much easier, as I don’t have to cook something for me and something else for him. That makes life so much simpler. We found a book with a life plan for folks needing to lose belly fat and enthusiastically set out. After four weeks of diligent work, I stepped on the scale and it had not budged. Not even an ounce. That’s the kind of thing that usually sends me straight to the Blue Bell Moo-lineum Crunch aisle, but God is blessing this effort, and He has kept my focus. I began tweaking my meal choices, and invested in another great book that helped me to really understand the role that food should play in my life. I’m not offering the names of either of these books here, because, as I mentioned before, nutrition is a hugely personal issue, and I’m tailoring the meal plans to suit our lives. If, however, you are interested in knowing which ones they are, put your e-mail in the comments section and I’ll be happy to share the titles with you. The main gist of our eating plan involves eating whole, organic foods, prepared in my kitchen. We eat six small meals a day, breakfast, lunch, and dinner, with three snacks. Each snack combines a protein and a carb to help with blood sugar balance. There are lots of vegatables, some fruit, some meat, and some dairy. I’m not a huge fan of bandwagon science. What’s good for you today will be discovered to cause cancer next year. So, we just eat foods that are simple, organically grown (for the most part) and whole. My rule of thumb is I don’t prepare or eat it if it isn’t something my great grandmother would have served. We are now seven weeks in, and I’m happy to report that I’m about five pounds down, and Gary is about eight down. I can tell a huge difference in my running and in the way that my clothes feel. Another exciting plus is that a couple of weeks ago, when I became sick with a sinus/ear infection, I got well very quickly and was running again within a couple of days. I have felt better, less “weighed down”, if you will. And, I’m cautiously optimistic that the weight will continue to come off, even though glaciers melt faster than this. One of the most precious things that age has brought to me is my ability to be patient. I’ve learned that slow is good, and the more slowly I do or learn something, the more likely it is to stick. My happy foods have changed over the last weeks. I love a venti soy au lait sprinkled with cinnamon and shared with friends, a full bodied, smooth glass of red wine enjoyed while watching the sun go down off my deck with my man, the tart, pungent taste of ripe strawberries. Who knew? I’m trying to add one “super food” to our diet each week, and Gary is gamely trying them, although sometimes he only tries them once. If you have a recipe that makes kale a happy food, please share it. So, far, no happiness there. I reblogged a post from a blogger that I enjoy because it touched something that is very dear to me. The fact that we have to push ourselves beyond our perceived boundaries if we ever want to grow and change. There’s another post in that for me, but, for now, I’ll just apply it this way – make your health a priority, push through the boundaries that limit you – the “I can’t lose weight, so I’m not going to bother,” or the fact that you don’t like certain foods, so there’s no point in eating them. We’re grown-ups now, it’s time to move past that, learn what works for you, then do that for the rest of your life. I want to face God with the knowledge that I didn’t let Him down by the way I treated ((or mistreated) my body. That’s my prayer for you, too. Love this post – stepping out of our comfort zone is SO essential to growth! Thanks, Eric! I’ve had several discussions this week with friends about motivation, not just in running , but about motivation in all aspects of life. So, as usual, it got me thinking about it. About how we so often let it define us or excuse us from something we don’t want to do. Motivation is like that popular girl we knew in high school, the one we all wanted to be friends with. Then, when we were actually invited into the magic circle of the pretty, popular girls, we usually learned that she wasn’t who we thought she was, after all. She was mean and two faced. Motivation is a lot like that. She’s a mean, fickle girl who flits in and out of my life with reckless abandon and complete whimsy. She sometimes wakes me up at 4 am for a run, urging me to slap on my shoes and head out to get the best of the day. She sings praise and worship song sofly in my ear to get me going, then slams me with Queen, Steppenwolf, and Jonah 33 to get my heart pounding. We’re breathless and sweaty by the end, but we both feel wonderful and ready to face the day. Then, the very next morning (usually spin class morning), she sleeps in and encourages me to do likewise. Last summer, when I was training for one of those life defining moments (the NYC marathon), she completely left me to battle the long runs in the Mississippi summer heat alone. She packed her things and went on an extended vacation in the islands. It wasn’t motivation that kept me going that long, hot summer. 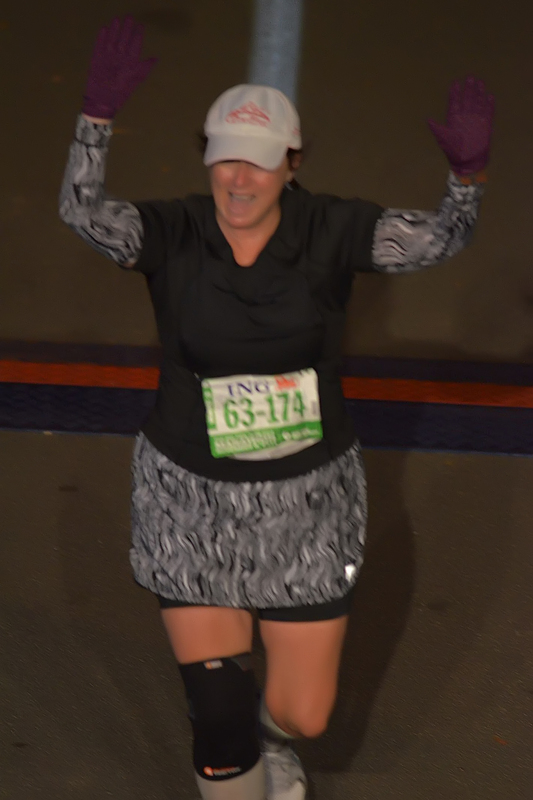 It was something else, maybe grit and determination, or maybe the thought of having to defer NYC again, or worse – not finishing something I had started. Whatever it was, motivation didn’t play a big part in it. She flitted back in after I spent a long weekend training with Jeff Galloway in Blue Mountain, Florida. She was all thin and tan from her extended vacation in the islands, but lucky for her, she stayed with me most days until marathon training was finished and the bright lights of NYC finished up her job. So what keeps you going when you really don’t want to? It’s different for all of us, but I’ll share some of my tricks here in the hopes that you can make one of them your own. Mix it up. You may be getting bored with your workout, so try something different. It can be as simple as a new route, or you may want to add some cross training in. Cross training will become your best friend if you’re in this for the long haul. It helps with burnout & injury prevention. I do spin class a couple obscenely early mornings a week, and now that the weather has warmed up, I’ll include some swim days as well. To call myself a swimmer or cyclist would really stretch the boundaries of those words, they’re just something I do to keep it fresh and keep me off the injury list. Love yoga, just don’t work it into my week like I should. Sign up for a race. That will get you focused quickly. Nobody wants to be the last one across the finish line, although somebody has to be. Get techy. Mother’s Day is coming up, ask for an new toy. Some of my favorites are my Garmin Forerunner (lots of different models, price points, & bells & whistles), and of couse my Ipod. If you don’t have those, they may breath new life into your plan. Read something inspirational. I follow several blogs (see my blogroll in the right hand column), read a couple of different running magazines (Runner’s World and Women’s Running are current faves), and usually have a running book going at any given time. I’ll be happy to offer a few suggestions, or even loan you one of my favorites, if you like. Find a workout buddy. This one doesn’t really work for me, I like to run alone, but lots of people find the accountablity of knowing someone is depending on them for their workout makes a big difference. Join a running group. There are lots of great clubs and groups you can join, in our area The Pine Belt Pacers are a great group who sponsor lots of races & have group runs throughout the week. If you’re not into that, I belong to an online group called Daily Mile that I enjoy. There are a lot of local runners on there, and it keeps up with my stats for me, which is always fun, especially at the end of the year. Kind of like Facebook for runners, but without all the drama. Find a mentor. There are lots of people ready, willing, and able to help. With varying degrees of proficiency. I’m always available for a chat, and I work cheap – buy me a cup of Starbucks & I’ll talk your ears off. Remember, you get what you pay for; but, if it’s possible to do it wrong, I probably have, so you can at least learn from my mistakes. I can’t recommend Jeff Galloway enough, he has lots of books available, and does workshops around the country at some pretty cool spots. Really neat guy, too. He’s been running longer than I’ve been alive, and that’s saying a lot. A friend of mine, Mary Williams, offers a great workshop locally (if you’re in South Mississippi) – you can check it out on her blog here. Both those links are on my blogroll if you don’t have time right now. I hope something here speaks to you & helps you if you’re in a rut. I think that what helps me the most is remembering that I’m a grown up now (sigh), and, occasionally, in real life, we have to do things that we’re really not in the mood for. Make your running a habit so that when those days come , and they will, it will come automatically. Same in running, as in life. Happy trails, guys! Remember to follow by e-mail if you want to be notified whenever a new post is out. I’m shamelessly begging for followers, so, please add yourself to the list. Only takes a few seconds, and a couple of clicks of the mouse. Thanks! !